Necrochasm. One of the mythic Weapons of Sorrow that has cast an ever present shadow over the resolute Light. There is some truth to the fables about this weapon. Terrifying truth. The legends tell that this rifle was created after the day when Crota’s deadly sword first split open the surface of the Moon. 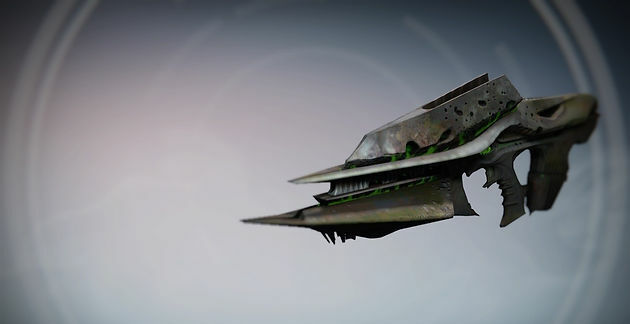 A lost and dead Guardian’s weapon had been turned from an instrument of the Light as the Hive attempted to fuse their dark understanding, with the mastery of war held by humanity. The result was a weapon that would feed on its owners hate, passion and anger. It would cleave through flesh and bone of its victims with the rising focus of angry eyes and hate filled hearts. If you wish to hold this weapon and use it against the onrushing Darkness, you must ask one question. Can your Light survive it? Can you stand in the gaping maw of the abyss and still shine bright? Many have tried. Will you succeed? The Necrochasm. This warped and twisted manifestation of the Hives dark power. Quite a solid arc auto rifle. It has a rapid fire rate with decent stability and recoil that is quite easy to manage although it has a lower impact, however this isn’t really a problem due to its relative ease to keep on target. Its exotic unique perk, showcases the depths of the Hive’s influence on this weapon. Cursebringer frequently triggers a cursed thrall explosion when you score precision kills. This perk does not activate all the time but it seems to pop up close to around 80-90% of all precision kills you make so not a bad percentage. If any of your Guardians have been on the receiving end of a cursed thrall explosion, you will know how devastating it can be which allows this gun to deal out even more damage to closely grouped enemies. In a PVE setting this exotic can be devastating to your enemies with the additional explosions that will be consistently going off if your aim is true as well as its decent impact and rapid fire rate. In PVP this auto rifle can be straight up fun to use as it sows chaos and dissension when you eliminate your opponents. Used correctly it can be a beast of a weapon, however due to a low range stat, it would be best to use this weapon from close ranges and not get into any long range engagements. This exotic screams Hive all over it which makes sense having been altered by the chittering species themselves. The front the weapon, towards the end of the muzzle has the appearance of sharpened bayonets that have been moulded into its design. It provides Necrochasm with a fierce and dangerous look. The trigger guard and the magazine both appear as if they were carved from bone or a type of rock that resembles bone, which knowing the Hive isn’t out of the realms of possibility. The top of the auto rifle is pitted and looks like the surface of the moon with the cracked and sunk surface as a result of the Hive burrowing underneath the crust. The main and most intriguing design feature of this gun cannot really be given justice in the above photo and that is a green mist that seems to ink out of the sides. It is awesome to see and further conveys the unknowable magic and Darkness that went into the creation of this exotic auto rifle. The Necrochasm is a Year 1 weapon being left behind as the Dark Below Raid got left behind (maybe thats where you get it?) but if you want to gain this weapon for your collection, here is what you need to do and I hope you are ready because its not going to be a quick addition to your armament. First you need to acquire a Husk of the Pit. This is a level 10 white rarity auto rifle that is dropped from Blades of Crota. When the Dark Below was the latest expansion, you could find Blades of Crota on any planet that had a Hive presence (Earth, Moon) but now you are limited to running the mission The Fist of Crota, which is the first mission of the Dark Below. When you spawn in, hop on your Sparrow and ride into the complex behind Omnigul (careful of the adds). Keep going through the building until you come to an openish room with three acolytes in a ritual pose with a green aura all around. Approach them or shoot one of them and the Blade should spawn in. The Blade has an arc shield and a decent amount of health so be ready for a fight. If you are lucky the Husk of the Pit will drop like a normal engram and enter your primary inventory so make sure you have open slots if you want to check if you got it right away. If you didn’t acquire it then just reload the mission and repeat the above steps. Hopefully it won’t take too many runs to get this auto rifle. Once you have your Husk of the Pit, you will need to upgrade its single ability slot which doesn’t take normal XP. Instead you will have to kill a total of 500 Hive enemies so it is recommended to do the mission ‘The Dark Beyond’ as that will give you a lot of Hive enemies very quickly. However do not kill them all or finish the mission. Let one of them kill you and you will spawn back to the start of the ‘We’ve woken the Hive’ and the oncoming rush of Thrall. It will make it a lot easier. After all those Thrall deaths you can upgrade your Husk of the Pit to the legendary auto rifle, Eidolon Ally. This weapon fortunately can be upgraded with normal experience. Now for the random part of the experience. 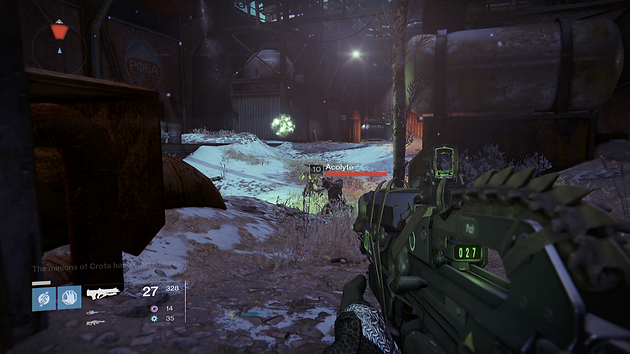 You will need to go into the Crota’s End Raid on Hard mode (you will need a team for this) and defeat Crota himself. This can be a bit challenging with people not running Crota as often as they used to but if you look long enough you will find someone. After you defeat Crota if you are lucky enough, you may get an item known as the Crux of Crota. If not, you will have to keep trying for the Crux and may luck go with you. If you do gain the Crux however, and you possess a fully upgraded Eidolon Ally, the last perk can be unlocked with the Crux so activate it and low and behold you will have your brand new Necrochasm which coincidentally will be fully upgraded so you can get straight into the fun.